Norm is an avid ice fisherman who retired from GM 12 years ago after 30 years. He lives in Lewiston Michigan with his wife Teri. He spends most of his free time in the winter ice fishing. Norm has been a member of the HT pro staff team for the last 3 years. He started teaching ice fishing class for the Michigan DNR last year and was put on their pro staff. Norm has been a guest on several TV shows including Discovering with Buck Levasser, Michigan Outdoors and The Iceman Show TV series and the radio talk show Wild Michigan Outdoors with Duran Martinez. He has fished many tournaments with several first place finishes and many top 10 finishes. 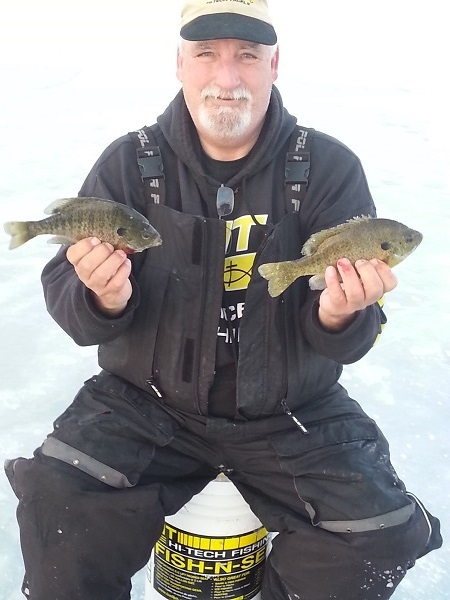 Norm’s most enjoyable moment on the ice is working with children teaching them to tightline and seeing the excitement when they catch their first fish.Norm is an avid ice fisherman who retired from GM 12 years ago after 30 years. He lives in Lewiston Michigan with his wife Teri. He spends most of his free time in the winter ice fishing. Norm has been a member of the HT pro staff team for the last 3 years. He started teaching ice fishing class for the Michigan DNR last year and was put on their pro staff. Norm has been a guest on several TV shows including Discovering with Buck Levasser, Michigan Outdoors and The Iceman Show TV series and the radio talk show Wild Michigan Outdoors with Duran Martinez. He has fished many tournaments with several first place finishes and many top 10 finishes. Norm’s most enjoyable moment on the ice is working with children teaching them to tightline and seeing the excitement when they catch their first fish.